The KitchenAid stand mixer juicer and sauce attachment supplies nutrient-rich juice without taking up extra counter space. 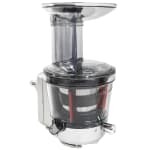 The juicer attachment accommodates a wide range of fruits and vegetables and allows the user to determine the amount of pulp the juice, sauce, or jam will have. It also eliminates a step by slicing the products before it processes them.